Klick Technology was established in 1981 by Len Whitehurst and it remains a family business to this day. 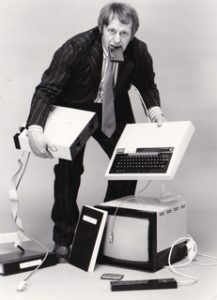 Len is pictured here in a 1980’s publicity shot to launch the highly successful Klick computer trolley which, in the days of one computer per school, was revolutionary for transporting all the necessary equipment around. In our 35 years of delivering successful projects we have acquired an unrivalled depth of knowledge which is critical when designing and managing the complex projects we work on today. We have built up a long standing team of diligent people with an honest approach, who really want to please. Our portfolio of discerning clients spans a range of sectors including education, health and commercial institutions. 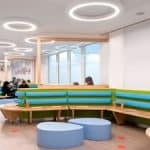 We deal with a cross section of projects from small primary schools to multi room university fit-outs and strive for the very highest standards across the board. We aim to be a trusted partner by providing exceptional service and support. Our commitment to customer satisfaction is underpinned by a high level of integrity and a genuine desire to deliver outstanding projects according to an agreed brief. "Klick Technology were nominated to supply furniture for the refurbishment of the science block at Emerson Park School. Their designers were instrumental in helping the school create layouts which work specifically for each different space. This involved developing a number of design concepts which were then discussed and developed in conjunction with the school. The project was executed within a tight time frame but Klick were proactive in keeping everything on track and their service has been of a very high standard. We look forward to working with Klick in the future." "Their project management team provided excellent support throughout and the installation team were proactive on site. The staff at the Guildford office have nothing but praise for Klick and hope to work with them again in the near future." "Klick Technology were called in to supply and install three areas of bespoke storage at the Apperley Centre, Gloucestershire. Klick made the job very straight forward, with clear design information and helpful staff. The project ran smoothly with the minimum of fuss and the clients are very happy with the end result. Looking forward to working with Klick again in the future." "Klick Technology had a very proactive approach and were a pleasure to work with during the project. The client (St Joseph’s Catholic High School) is delighted with the completed work and the manner in which it was carried out. We were impressed with Klick Technology’s high level of service and hard work. We would certainly consider them for future similar projects." "Thanks for all you and Klick did on the refurbishment to our Chemistry Lab over Easter. It looks great and has given the department much more kudos with the students. They are still, half a term on, excited about doing science in there. I really appreciated your personal attention and time in this project and that really helped us find the perfect solution for what we wanted to end up with." "Klick provided the furniture for the new art and design facility at Bedales School in Hampshire. Their staff were patient during the design phase, making suggestions to ensure the design brief was answered in a practical way. Their project management team provided excellent support throughout and the installation team were proactive on site. The staff at the Guildford office have nothing but praise for Klick and hope to work with them again in the near future." "On behalf of Kier Group and the team at Brannel School; we would like to thank Klick on their efforts and performance on the installation of the fitted furniture package. A combination of helpful backroom staff and on site workers ensured an efficient completion of works." "Klick worked closely with us to design and install 2 new science labs this summer. They were helpful from the start, providing alternative design options to achieve a perfect solution to our issues along with a cost effective solution. The project centred around a bid to the Wolfson Foundation and Klick were understanding of the timescales and limits this placed on us. As soon as we received the grant funding Klick were quick to respond. The installation team were amazing, going beyond expectations to ensure we hit the deadline to complete the rooms for the new academic year. 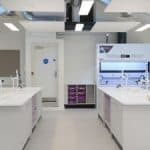 The rooms have been transformed and we are delighted with the designs of both labs which have ensured that available space has been maximised creating a better teaching and learning experience for everyone." 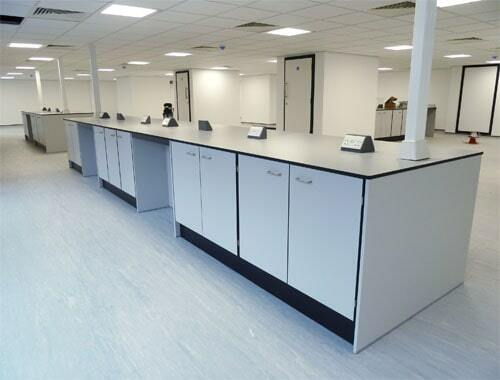 "Klick were selected by Interserve to supply the laboratory furniture for the project at The University of York. Initially they were proactive with providing information during the design phase, sourcing special colours and providing samples. Their package was cost effective. They also proved to be reliable and flexible in adapting their programme to react to site conditions. They developed a good working relationship with our site team, remaining supportive and professional throughout the project, dealing with any snagging issues promptly. Interserve are currently in discussion with Klick regarding further projects at the university and I would be happy to recommend them to others." "We were impressed with Klick’s functional teacher’s storage wall design which has greatly enhanced our new classroom block. The spacious storage area behind the white board cupboard doors conceals equipment and materials leaving the rest of the rooms clutter free. There is ample shelving for books on either side of the central whiteboard. Klick sourced special colours to match our existing scheme to complete a truly bespoke installation." "Klick completed the conversion of one of our classrooms into a new food technology room designed specifically for children aged 5-11. Although the project was started in half term, the majority of the work was scheduled for completion during term time. The project was well managed with little disruption to the school routine and was completed on schedule. The staff and children are delighted with their colourful new food room which helps to promote healthy eating from a young age." "Despite a tight schedule, Klick’s project management team overcame several difficulties on site and completed the works on time and within budget. 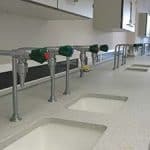 The school is really pleased with the new food room and the professional way the contract was managed." "The final result is classrooms that have been purpose built, which have dramatically improved the feel of the school within this area. Both students and staff alike have complimented the high standard of work and the professionalism that Klick showed throughout the project. We would highly recommend Klick Technology!" "Klick were able to tailor our workspace to exactly what we needed with suggestions and guidance on finishes and layout. The work was scheduled in for when was most suitable for us and was carried out with the minimum of fuss, on time and to budget."